Speed is irrelevant. If the approach is wrong or the aircraft can't stop (as noted above), the go button will be pressed and the pilot gets to go around and do it over. Or go around, jettison stuff and do a VL. Extra fuel will have to be reserved to enable either course of action. That will cut into bring back loads. just take it from me, SRVL allows bigger bring back loads than VL. Fact. No its not a big revolution in carrier operations. But it does what it says on the tin. Enigmatically, I don’t understand the logic of the last paragraph. Surely, no matter the means of recovery, trap, vertical or SRVL, aircraft can be returning to ship from missions low on fuel and a bolt whether from failed trap or aborted SRVL can push that aircraft into a situation where it might need buddy buddy refuelling. Surely therefore, if it were ever to become available to the RN whether through modified F35’s or Ospreys or other future aircraft, and by some miracle the funds to afford it, we would take that option? SRVL will allow greater bringback under normal operational circumstances but that cannot always be guaranteed. Imagine what just an extra unplanned 5 mins flying in air-to-air combat would do to planned fuel reserves. 1. Of course it does, did anyone say different? 2. Don't tell me it's not a revolution, tell your fellow Brits that are treating it like such. 3. Like I keep saying, to avoid having a tanker, SRVL requires the aircraft to maintain increased fuel for a possible go around. Actually, you need increase reserves even if there was a tanker because you'd need extra fuel to go mate with it. That decreases bring back. Maybe by a couple thousand pounds? 4. VL will remain the landing type of choice unless it means jettisoning expensive weapons. Th RN managed this very well for along time with Harriers. F-35B's don't make the problem better or worse, as far as I know. I'd be willing to bet a small amount that the Type 26 flying deck will take an F-35B as will the Tides and the new FSS. For emergencies. There's not always a Spanish tanker close by. But I do think your question is a fair one i.e. what value does the RN put on Osprey with a tanker option. What value does it have as a carrier force multiplier? We've heard a lot from the RM that they're hot to trot with refueling their Merlin, presumably for long range insertions. Unfortunately Osprey is a Boeing product so chances of a single source order would seem rather slim at the moment. Though a small order for less than half a dozen wouldn't break the bank much more than it's currently broken. The Japanese bought 5 for less than the current price for 2 F-35B's say 250 million pounds total, including service, spares & support. It would cost a bit more for the longer ranged CMV-22B. Hopefully some good pictures and videos from this. That's a great old shot of the Ark Royal, checked up online and it's 1957! Number plate " R08 F35 "
What's all that crap on the door? I remember going to a trade day at Farnborough on year and Lotus had provided the Red Arrows with a number of Esprits to shuttle them from the media area to the flight line during the show. I am not sure if it still goes on but they used to get a lot of "Gifts", as well, or at least the pilots did, such a Swiss watched and high end Mountain Bikes. 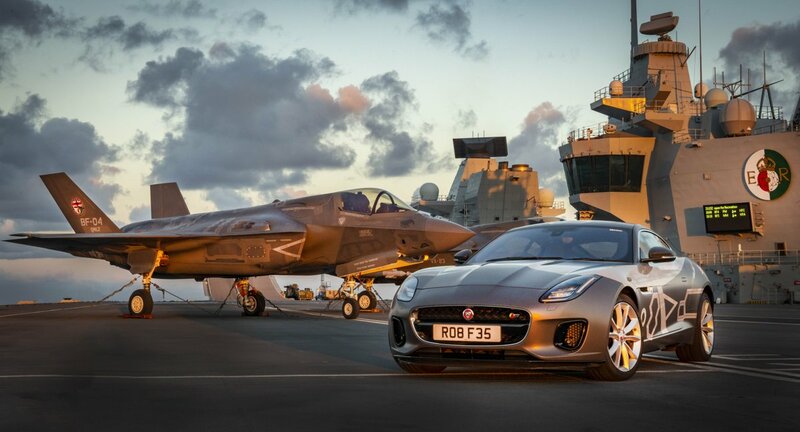 anyone remember what happened last time a Jag was on a RN carrier? Because you don't waste newer bombs that are only fitted with dummy concrete warheads. shark bait wrote: anyone remember what happened last time a Jag was on a RN carrier? Do you know what - I was thinking the exact same thing..
Oh excellent...I’ll be included NYC Monday through Wednesday! Anyone know where she is likely to be anchored/berthed? CR4ZYHOR5E wrote: Oh excellent...I’ll be included NYC Monday through Wednesday! Anyone know where she is likely to be anchored/berthed? Will USS Intrepid have more aircraft on deck though? Possibly a little premature...looks like a Merlin has landed at a New York HLS. Oddly it looks like HMS Westminster has a berth reserved in Hempstead Bay, Long Island...and the USNS Lewis and Clark (which trialled the Princess Royal Jetty for QE) is also in New York.